Yesterday Lizzie shared her story of starting out with home education. Today we hear from Jenny, who arrived at Home Ed later in her parenting journey. Alan and I have been married nearly 30 years and have six children. Our oldest four went to independent school from 3-18. They enjoyed the time they had there and partook in many wonderful experiences. I was very ambitious for them when they were little, wanting them to have the best start in life. I even retrained from a pharmacist to a primary teacher to get a job at their school to help with fees. It turned out I loved teaching and was quite good at it! All four older children went to university. As they got older, I realised that the path to ‘fulfilment’ might not come through academic excellence. In the blink of an eye they’d left home, three married and two now with children of their own. How much time did I really get to spend with them? Then suddenly, when I was enjoying my teaching career, along came our fifth child. She stopped us in our tracks. We were both in our 40s; our lives were pretty much mapped out. I would work a bit longer to pay off the mortgage, and Alan until his pension kicked in. I went on maternity leave and returned to work when our daughter was just over a year old. My employer wouldn’t consider a job share, so I returned full-time. Instead of being with my child, I was dropping her off at the childminder’s for long days, watching her grow up via photos. Remembering how quickly these years slip away, I handed in my notice. This is when home education first entered my thinking. Having given up a career I loved to be at home with my daughter, she would shortly be leaving me to go to school. I wanted more time with her. I wanted all the effort that I put into my teaching job to go into this wonderful little person. Initially, I think my reasoning was selfish. Almost four years after her birth, we were joined by our son, who is now four. At this point my vision of home education included timetables, play times and a bell – basically school at home! I had a sneaky suspicion it didn’t have to be that way, but that thought scared me. Around that time, I read an article about a home-educated family who threaded a rich, broad education throughout their lives – rather than being put in a box – including living books, music, poetry, arts, crafts and science. I wanted that! I needed to put aside my preconceived ideas and be open to doing things differently. That family followed the principles of Charlotte Mason (educationalist at the turn of the twentieth century). She advocated reading real books, written by authors with a specialism, as well as lots of nature study. Mason believed children should be allowed to make their own connections – quite revolutionary at a time where children had to be seen and not heard. She said, ‘Education is an atmosphere, a discipline, a life’. Another change for me was learning how our Christian faith can be woven into all areas of the curriculum. We enjoy learning about Jesus while studying geography, history or science in a gentle, natural way – not forcing Religion into a separate box and getting it out once a week. It also means that our principles of love, tolerance and understanding of anyone who looks different or believes something different can be woven into all areas of our education. We have a timetable which revolves around home education groups. We meet with different families for nature study, soft play, and climbing. One of our greatest blessings is to be part of a Christian Home Ed community which meets once a week and provides friendship and support for both my children and me. There is a rotation of monthly events which includes an educational trip, a topic group, a Lego/board game group and craft group. We also have socials, a Christmas party, nativity and talent show, a summer Sports Day, prizegiving and three-day camp. One of the leaders even organises an annual Home Ed conference. Our outside activities mean that we do ‘work’ 4 days a week. I have purchased reading, maths and English curriculums. We then include geography, science, history, composer study, poetry, natural history, literature, handwriting, French, artist study, drawing, folksong and hymn study – all based on the principles of Charlotte Mason. My daughter learns the harp, and attends Brownies and Boys’ Brigade. Being at home during the day, she can pursue her love of dance and gymnastics, training up to four nights a week and on Saturdays, plus some competitions. My son attends a playgroup two days a week at the moment and will continue there until the term after he turns five. We hold off-peak passes to many fun and educational venues, and enjoy visiting them in term-time when they’re quiet. The pace of our children’s education can go as quickly or slowly as they need. We can stop and run to the kitchen to demonstrate floating, or watch a You Tube video. If the children are very interested in a topic, we can do more learning. Generally, we can finish the more formal work in half a day, so can do something else for the other half of the day. I love that we can be having a conversation about Ancient Greeks and our daughter is doing the splits or upside down. She does use a desk but not all the time. I like that they’re encouraged to speak up and discuss what we’re learning about, to ask questions and have their own opinion. It’s OK to say ‘I’m hungry’ and stop for a snack – or to continue over lunch if we’re enjoying the topic. I attend a monthly Mums heart group with other home schooling and ex home-schooling Mums. I am going on a Charlotte Mason Retreat in Ambleside and to the Wild and Free conference in Stratford. I love to crochet, and attend a weekly crochet group. Besides working full-time, making it possible for me to home educate, my husband Alan takes time off work so I can attend days/weekends away and tries to be home early enough so I can attend my crochet group. He is extremely supportive, listens to me and gives advice. We do spend money on books, but maybe not as much as you’d think. I buy second-hand from Amazon marketplace, eBay, ABE books and Facebook home education selling sites. You can spend as much or as little as you like. If you decide to follow a prewritten curriculum and pay for it to be shipped from America it will cost a lot. But there are lots of blogs, podcasts, and free curriculums out there as well. People often ask, ‘What about GCSEs or university?’ Every year we re-evaluate our decision. Is it still working for us? If there comes a time where we think our children will be better in school, then we’ll send them. We’re very fortunate in this country to have that available to every child free of charge, and I’m supportive of it. This year home education is working for us as a family and we love it. If it continues to work, there’s no reason why we couldn’t home educate right through to university. 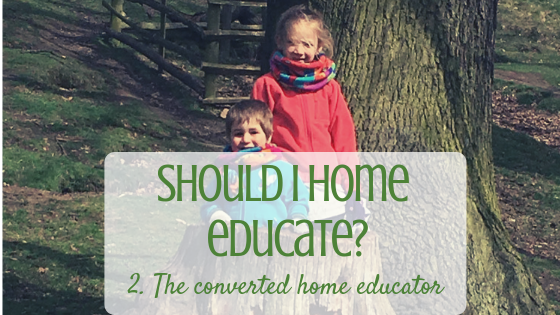 I think home education is worth considering in the same way you carefully consider which school to apply for. It isn’t the best thing for everyone but it’s good to send your child to school knowing you’ve made an informed choice. If you’re seriously considering it, or just starting out, my advice is to take it slowly, you have lots of time. Don’t spend lots of money on an expensive curriculum. Listen to some podcasts, read some blogs, join some local and national Facebook groups, ask questions and find the direction that is right for your family. I recommend this conference for finding out more if you can get to Coventry. I also love Wild and Free. 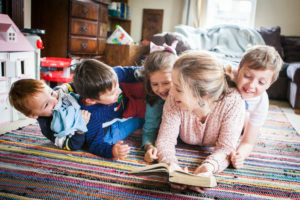 This article from The Telegraph features several home educating families. Do you have questions or encouragements for Jenny? Leave them in the comments! Read story no.3 “The hopeful home educator” here.